I wanted to see Grease when it first came out in 1978, but I was 5 and my mom—not unjustifiably, in retrospect—deemed me too young for it. I’m not sure what interested me about the movie, other than that it was part of the grown-up pop-culture world, and I wanted to see what everyone was talking about. Looking back, my fleeting interest seems like an attempt to get a head start on the adult world. At the time, I didn’t know that Grease wanted nothing more than to retreat from the same place. I’m not sure why I never caught up with Grease in those later video-store-haunting years when I watched virtually everything else available to a movie-hungry kid in small-town Ohio. Maybe it’s simply that a PG-rated ’70s musical didn’t have the same allure after I moved on to the harder stuff. But I discovered something as the years went by: Everyone else I knew had seen it. In fact, when I mentioned this blank in my moviegoing history, I was usually answered with “You haven’t seen Grease?” in tones reserved for questions like “You don’t like puppies?” or “You don’t believe in the moon landing?” Clearly this was an oversight I needed to attend to, if only to avoid feeling like an exile from a whole generation that treasured the movie. So as a newcomer to Grease, I can happily report that, yes, I found it to be the fun, bubbly musical I’d always heard it was, filled with memorable songs and all that good stuff. But it’s a strange movie, too, celebrating rock ’n’ roll and teenagers, sure, but mostly paying tribute to nostalgia as an end to itself. In Grease, there’s nothing so wonderful as the world we’ve already left, and no future so bright as the past. It wasn’t always so. Grease has its origins on the north side of Chicago, where life at William Howard Taft High School inspired co-creator Jim Jacobs. First staged in a tiny Chicago theater in 1971, it was—like American Graffiti and oldies radio—a product of the moment when kids who grew up on the first wave of rock ’n’ roll began to wax nostalgic about their youth. By all reports, the first version of Grease was a rougher beast than later incarnations, filled with far racier humor and less moony songs. (I’m particularly curious to hear the original opening number, “Foster Beach,” a tribute to a downscale paradise on Lake Michigan, not far from my house.) “When [co-creator Warren Casey and I] went to New York,” Jacobs told the Chicago Tribune last year, “we were told it was necessary to make the characters loveable, instead of scaring everybody.” And so began a process of bowdlerization that led Randal Kleiser’s film version of Grease to become a sleepover classic, and later produced a flood of regional-theater and high-school productions. 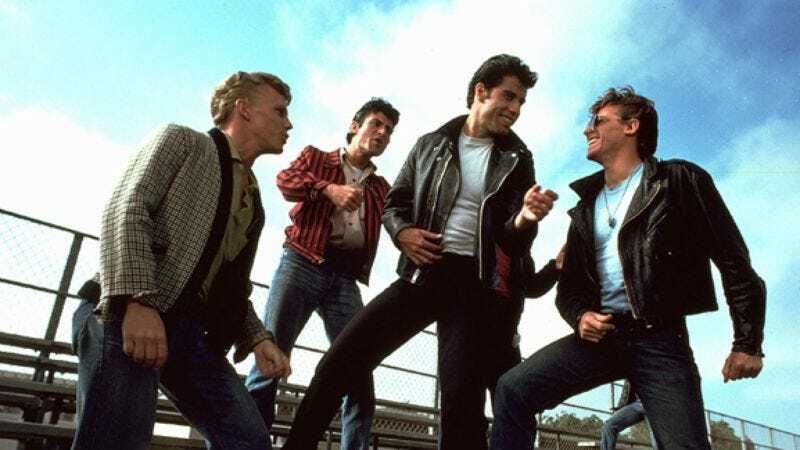 I don’t know how much rougher the original Grease was, but it must have had more edge than the film, where high school is a goofball paradise of tough guys and tougher chicks. The hours after school offer an endless cycle of malt shops, drive-ins, and some of the least-dangerous-looking gang activity ever committed to film. Sure, there’s a pregnancy scare that turns out to be a false alarm (just like they always do in real life!). The leads, Danny and Sandy, have trouble getting and staying together, and one character’s beauty-school career meets a dead end. But mostly, the film offers a blissful parade of carefully contained rebellion as it doles out teen angst with a wink. The winking is what kept me from loving the movie. From the moment Grease opens on John Travolta and Olivia Newton-John frolicking on a beach, we’re in the highly artificial world of movie musicals. But where thoughtful musicals—however frilly—create an emotional reality all their own, Grease doesn’t let anything like messy feelings get in the way of the good times. Apart from one scene, that is. Her character has thought about the paradise promised to a whole generation of kids coming of age in the 1950s—a vision of picket fences, cardigan-clad husbands, and loving kids—and turned it down. Rizzo gets a string-drenched ballad for her big number, but it’s the most rock ’n’ roll moment in the whole movie. Elsewhere, there isn’t much rebellion, just rebellious attitudes. By the ’70s, 1950s kids had turned into grown-ups, and they started to get misty-eyed looking at the world from which they came. Grease gave it back to them, and to their kids, as a polished fantasy. Here, the past is better than the past ever was. An image of Martin Luther King joins the cartoon montage that plays beneath the opening credits, but otherwise, Grease offers no indication that the ’50s had much going on beyond milkshakes and “La Bamba.” (You can even make out some black students hanging out in the background of a couple of shots. True, they don’t get any lines, but they still get to be in the picture.) It’s a theme-restaurant approach to the past: just the good parts and nothing that hurts. Even the pain doesn’t feel painful. Though one contrivance after another separates lovebirds Danny (Travolta) and Sandy (Newton-John, whose casting forced a lot of awkward references to her character’s immigration from Australia), there’s no grit to their lovelorn laments. What stands in their way is less Romeo And Juliet than a comedy of manners—he’s too greaser tough, and she’s too poodle-skirt tender—and that makes perfect sense. High school is a time when even the smallest drama feels like a major crisis. Yet Grease never brought me into their emotionally inflated world. Mostly, their problems seemed silly. It doesn’t help that obvious adults are playing the characters. That sort of element shouldn’t matter in musicals; Judy Garland was 17 when she played 12-year-old Dorothy, but who cares? But watching 28-year-old Newton-John, 25-year-old Didi Conn, and others burlesque their way through high-school drama adds another layer of distance. When the material has an emotional tug, it doesn’t matter. Channing looks every one of her 33 years singing “There Are Worse Things I Could Do,” and I still bought it. When the movie has no agenda but goofing on the past and the teenagers that lived there, however, it just looks like a bunch of grown-ups making fun of the kids they used to be. The standout exception is, unsurprisingly, Travolta, then in the midst of a white-hot, star-making winning streak that included Saturday Night Fever and Urban Cowboy, before he hit a dead end with Brian De Palma’s great, overlooked Blow Out. Travolta played Danny on Broadway and spent years honing his comedy chops on Welcome Back, Kotter. In the film’s non-musical moments, he gives Danny the lived-in, overstated familiarity of a sitcom role. But when he dances, he carries himself with a magnetic grace that makes it impossible to watch anyone else onscreen. From Saturday Night Fever through Pulp Fiction, Travolta has always overshadowed his dancing partners. He moves with such unselfconscious pleasure that he seems to forget everyone else. Young Travolta probably could have danced to old commercial jingles while wearing a bear costume and still looked cool. Thinking about John Travolta today makes me feel a little more generous to Grease than I might have felt otherwise. The Travolta of Grease has given way to the Travolta of Old Dogs and The Punisher. In his first blush of stardom, and again during his post-Pulp renaissance, Travolta used to bring a touch of magic to everything in which he appeared. That, to put it kindly, is no longer true. So maybe I shouldn’t be so hard on mindless nostalgia. The past is never as good as you remember it, but its certainty has its own comforts. Grease lets an in-his-prime Travolta loose in a world made up of the safest parts of the ’50s, a place that didn’t yet know the blood and distrust the ’60s and ’70s would bring its way. It’s filled with kids—well, “kids,” anyway—who’ve yet to know divorce, abortion, dead friends, professional disappointments, personal betrayals, and the slow erosion of dreams. It won’t last, and in its final moments, I get the feeling Grease knows this too. “Well, what are we going to do after graduation?” almost-age-appropriate co-star Dinah Manoff asks. “Maybe we’ll never see each other,” another student laments. “That’ll never happen,” Danny assures them. How does he know? Because they have the together-forever promise of a song called “We Go Together” to send them off and up, riding in a dream convertible as they ascend toward the sky and into the future, with all its boundless promise. Then the movie ends.